The Cox Bolt Gun is perhaps one of the most weird and dangerous tools ever conceived. It was a device used by salvage crews for underwater repairs. A user, whether in scuba gear or in a deep-sea diving frock, would fire a bolt into a piece of steel. The bolt has an explosive charge on one end, which would detonate and essentially weld itself to the other side of the steel. It was an especially dangerous tool when used to repair oil tankers. 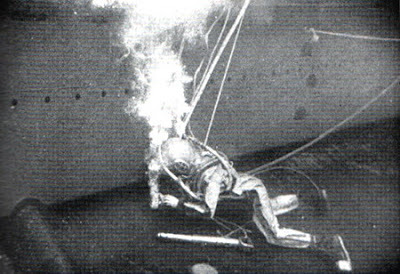 In such situations a diver would risk the chance of igniting fumes and causing an explosion. 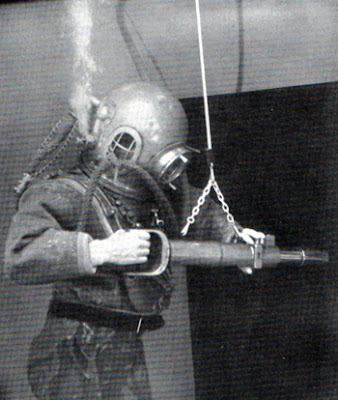 A diver using a Cox Bolt Gun to attach a pressurized airline to a submarine. Prior to the invention of the [Cox Bolt Gun] the diver may have spent many hours drilling, tapping and screwing bolts into steel and wood. The Cox Bolt Gun quickly became an indispensable piece of equipment for the underwater salvor. Repairs could be done in a matter of hours rather than days. This became so important as it allowed the salvor to recover valuable cargo before deteriation. In other cases a temporary repair could be effected allowing a ship to be removed from enemy exposure during conflict and from the conditions of the weather and tide. The Bolt driving and punching gun could be used for a wide variety of uses, operators often finding new uses for the tool. Patching of large and small holes could be made and rivets could be tightened by firing a bolt through them. Brackets, eye bolts and plugs could be easily attached in a few minutes. The gun was operated by an explosion which drove a solid or hollow bolt into steel or wood. There was no recoil or flash with the gun under normal operation. Whilst the solid bolt was used for fixing, the hollow bolt could be used to attach an air line or the means of passing through the plate of a cable. By fixing an air line to a submerged vessel it was possible to supply trapped sailors with a vital air supply. The barrel of the gun was loaded on the surface and lowered to the diver. Loaded sealed barrels could be carried by the diver and inserted into the gun. Providing the diver was fed with new barrels he could work continuously and therefore complete the operation in a timely manner. 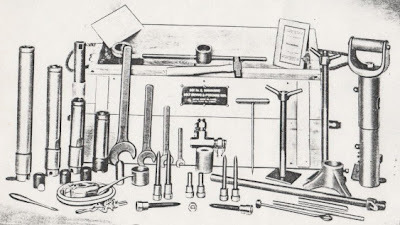 The Cox Bolt Gun consists of a number of components. A typical model, weighs 36 lbs. and features two different types of barrels: one for bolting and one for punching. Both were about 7 inches long. The bolt ammunition was 5/8 inches in diameter and 4 1/2 inches long. The bolt was heat treated and made of alloy steel with a tensile strength of 16 tons. A 3/4 inch plate required a force of 12 tons to fix through. The punch ammunition is 11/16 inches in diameter and punches a hole to suit the size of the bolt. Extension bolts were used for fixing patches of wood and were 1 inch in diameter. To these, wing nuts could be attached. The weight of the gun as we have mentioned earlier was 36 lbs, and could be tiring if many holes were to be punched. To relieve the weight 2 eye bolts were attached to the gun and springs or elasticated rope fixed. The gun was then lowered to a position a couple of feet above the diver who could easily pull into position for firing and then returned away from the work area.